The Femelottes and Près de la Dame localities extend across the bottom of the slope of Puligny and are made up of chalky clay soils on a limestone parent rock that is typical of the sector. 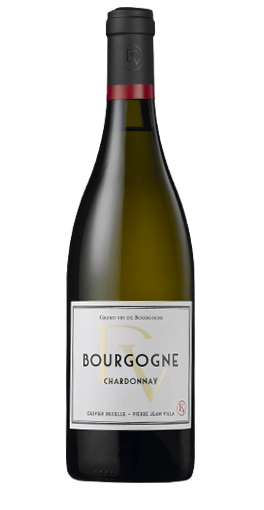 Decelle-Villa Bourgogne Chardonnay is light and frank colored with mineral and citrus aromas. On the palate, freshness and vivacity are underscored by fruity and slightly toasted notes with nicely melted oak. It goes perfectly well with onion tarts, seafood platters and fish, but can also be served on its own as an aperitif. Selected grapes are hand-picked and then gently crushed in our pneumatic press. After decanting for a night in vats, the obtained juice is placed in casks in our cellar where the alcoholic fermentation is undertaken without the direct addition of artificial yeasts. Decelle-Villa Bourgogne Chardonnay is matured for about 12 months in casks (15 to 20% new oak) and then blended in stainless steel vats for several weeks before bottling. Olivier Decelle (owner of Mas Amiel in Roussillon and chateau Jean Faure in St Emilion) and Pierre-Jean Villa (a young and talented winegrower in Côte Rôtie, Saint- Joseph and Condrieu) settled their cellar in 2010 in an historical building ( 1880 ) of NUITS-SAINT-GEORGES. They acquired 5 hectares of vines in Cotes de Nuits and Cotes de Beaune and also purchase selected grapes from great parcels. The Vines owned by DECELLE-VILLA are farmed organically to preserve the life of the soils and the perfect expression of the terroirs. They aim to produce elegant, delicate,accessible yet complex wines.